IHS iSuppli has determined the Amazon's Kindle Fire to costs $201.70 USD to manufacture and build. 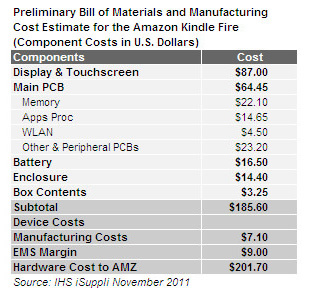 The BOM (bill of materials) cost is $185.60 while actually making and assembling the tablet costs Amazon roughly $16.10. The total reported is actually slightly less than the $209.63 cost iSuppli had indirectly figured a couple of months ago. The Kindle Fire's screen is by far the most expensive component found in the tablet, running about 47 percent of its total BOM cost. Components from long time Amazon partner, Texas Instruments, are found throughout the device. TI supplies the 1GHz OMAP4430 processor, power management and audio modules which gives TI about $24 per unit sold. With the above in mind, the Kindle Fire is not the only product being sold by Amazon at a loss. The basic Kindle can be had for $79. That price is rumored to be well below its estimated cost to manufacture. Since Amazon actually loses money with every Kindle it sells, the company must plan to make up the difference through selling books, movies, music and apps. This approach is certainly not unique, but when research, development, software and advertising costs are thrown into the mix, Amazon will be fighting an uphill battle to subsidize the cost of its Kindle products. In order to keep costs down, the online retailer made some budget-conscious decisions, such as the omission of a camera and 3G/4G connectivity, the inclusion of a cozy 7 inch screen and packing only 4GB of internal storage into the device. These choices allow Amazon to offer an inexpensive product that can rival competitors like Apple's iPad, but still focus on what it does well, which is books. With a projected 5 million units planned to ship before 2012 rolls around, the Fire is doing remarkably well.